A multi-generational story that takes place over a weekend and follows a mom and her son who visit the mom's sister. Margot at the Wedding release date was Friday, November 16, 2007. Margot Zeller, a savagely bright, razor-tongued short-story writer who creates chaos wherever she goes, sets off on a surprise journey to the wedding of her estranged and free-spirited, unassuming sister Pauline. Margot, with her all-too-rapidly maturing son Claude in tow, arrives with the gale force of a hurricane. 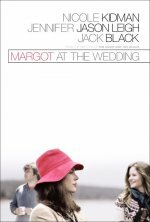 From the minute she meets Pauline's fiance--the unemployed artist Malcolm--Margot starts to plant seeds of doubt about the union. As the wedding approaches, one complication crashes into the next: vengeful neighbors, a beloved tree in the backyard and Margot's own marital turmoil. The two sisters find themselves at the precipice of an unexpected transformation ultimately revealing that even when your family is about to implode the one thing you can cling to for solace and comfort is your imploding family.